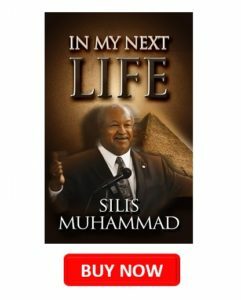 As a dialogue with United States (U.S.) President Barack Obama’s administration about America’s failure to honor its reparations obligations to Afrodescendants is opened, Mr. Silis Muhammad also advances his long-time track record in the fight for Afrodescendant human rights and reparations for slavery. Houston, TX (April 9, 2014) Silis Muhammad, the foremost leader in Afrodescendant human rights and reparations, recently informed the Black public of his letter to U.S. President Obama, Congress, the Joint Chief of Staff, and the Pope of Rome, outlining the Afrodescendant claim for reparations for slavery while also growing his long list of achievements in the areas of human rights and reparations. Click to read the letter . While Mr. Muhammad’s letter may interest the Black Family, it may not be known that Mr. Muhammad’s work as a proven worker for Afrodescendant human rights and reparations for plantation slavery goes as far back as 1994. Vice President Raashida Taalib-Din of the Lost-Found Nation of Islam/Afrodescendant Nation, said, “the first time that I heard his “Separation, Reparations, and Taxation” lecture in Chicago, Illinois in 1990 is when I first recognized Mr. Muhammad’s quest for Afrodescendant reparations.” Read the letter to U.S. President Obama here. 1994 Petition for Reparations to the UN under 1503 Procedure – Mr. Muhammad delivered a 1503 communication to the UN Working Group on Communications on behalf of African Americans. 1997 Written Statement to the UN – Mr. Muhammad recommended opening a forum so that African-American human rights grievances, that formed the basis of a petition submitted, can be expressed systematically, as well as officially recorded, evaluated, and remedied. 1998 Written and Oral Statements – Mr. Muhammad urged the Commission on Human Rights to assist African Americans in their efforts to recover from official U.S. policies of enslavement, apartheid, and forced assimilation. Mr. Muhammad prayed that the human rights of African Americans be recaptured politically and amicably, rights to self determination rectified, and the damages sustained be awarded in great measure in order to accomplish the cathartic cleansing mentally, emotionally, and physically of 400 years of long-suffering. Mr. Muhammad prayed that the U.S. Government not be given the tacit approval of the UN to subvert the opening of a forum wherein African-American grievances can be expressed systematically, and officially recorded, evaluated and remedied. 1999 Written and Oral Statements – Mr. Muhammad requested recognition of the African American choice of human rights and inalienable rights. He requested the crime of plantation slavery, and its lingering effects, be rectified–which was, and is still, a crime against African Americans and against humanity. Mr. Muhammad asked the U.N. to establish a forum for the purpose of restoring African American human rights, their political being, and their status as a people. Mr. Muhammad urged recommendation that the Sub-Commission pass a resolution recognizing slavery and the slave trade as a crime against humanity. He urged the writing of a working paper as a way to begin analyzing African American’s situation. Mr. Muhammad urged African American inclusion in the Declaration on the Rights of Persons Belonging to National or Ethnic, Religious and Linguistic Minorities, or a new declaration be written for African Americans. Mr. Muhammad asked the International Labor Organization to look into America’s privately owned prisons. 2000 Written and Oral Statements – Mr. Muhammad asked that the U.S. pay reparations to the so-called African Americans, since the U.S. cannot restore the ‘mother tongue’ of African Americans if ever it wanted to. Mr. Muhammad recommended the U.S. be held liable, at the least, for the last 51 years, plus the additional years which are needed to resolve this issue. He asked that the UN place a reparation sanction upon America if the identity and language of minorities and Peoples are to be preserved. Mr. Muhammad asked that a precise dollar amount be given at a future date, if warranted, and that he stated that he would ask for the release of a number of African-American human rights victims who have been unjustly incarcerated in federal and state penitentiaries. Finally, Mr. Muhammad asked the UN to impose a sanction on the U.S. in the form of exemption from all taxation upon our people for as long as this issue is in the hands of the UN. World Conference Against Racism Written and Oral Statements – Mr. Muhammad recommended that the World Conference Against Racism declare a decade to consider the issues of slave descendants, including whether “LOST FOUND Peoples” is the term that best identifies slave descendants. Regional Seminars for Afrodescendants Oral Statements – Mr. Muhammad put forth the name Lost Found Peoples as a name in order to gain human rights protection for slave descendants, but the name Afrodescendants was agreed upon by unanimous consent. 2001 Written and Oral Statements – Mr. Muhammad urged UN intervention to protect and assist African-American leaders within a forum as they seek to determine the damage they have sustained and the means of reparation needed in order to bring them back to life as a People. Mr. Muhammad prayed for reparations for the damage suffered during slavery, and asked the Commission on Human Rights to hear the African American demand for the right to choose to reconstitute, and reconstruct lost ties, since no international instruments, arbitrations, mechanisms or laws requiring the recognition of minorities that can restrain ethnic conflict during 2001. Attorney Harriet AbuBakr, Mr. Muhammad’s wife, asked the Working Group on Minorities to cause minority protection to develop in accord with the African American needs for resurrection. 2002 Written and Oral Statements – On behalf of African Americans, Mr. Muhammad asked the Sub-Commission on the Promotion and Protection of Human Rights to acknowledge the decision that African Americans be recognized as Afrodescendant Minorities. Mr. Muhammad also recommended that the Commission on Human Rights pass a resolution requesting that the Sub-Commission on the Promotion and Protection of Human Rights place African Americans on its agenda, alongside Indigenous Peoples and Minorities. Mr. Muhammad also put forth a prayer for official recognition of a self-chosen collective identity and reparations for African Americans. 2003 Written and Oral Statements – Mr. Muhammad requested official recognition of new minorities, urged the establishment of an International Year for Minorities, requested support for the efforts of the Working Group on Minorities, and recommended that the Working Group on Minorities organize a second Regional Seminar for Afrodescendant Minorities. Attorney Abu Bakr asked the Working Group on Minorities to validate Afrodescendants self-chosen identity in its documents, and use any other means available to place the fact of the existence of Afrodescendants before the UN and the world. 2004 Written and Oral Statements – Mr. Muhammad called upon the UN to grant Afrodescendants protected collective human rights. Mr. Muhammad also asked the Sub-Commission to make a commitment to minorities that their interventions will be heard. Mr. Muhammad requested the recognition, protection, and assistance of the Commission on Human Rights, and the authorities of the UN. 2005 Written and Oral Statements – Mr. Muhammad recommended sanctions against all governments that have deprived Afrodescendants, for every day Afrodescendants have been so denied human rights. He also requested assistance to Afrodescendants in efforts to have a self-chosen identity recognized and protected by the entire UN and by the governments under which Afrodescendants live. 2006 Written and Oral Statements – Mr. Muhammad requested formal UN recognition of slave descendant’s self-chosen name, Afrodescendants, and requested restoration of slave descendants to the human families of the earth. 2008 Oral Statement – Mr. Muhammad requested that the UN Working Group on Minorities assist Afrodescendants to establish education for Afrodescendants in their original (mother) tongue. 2014 Open Letter to U.S. President Barack Obama – Mr. Muhammad sent a letter to U.S. President Obama, Congress, General Dempsey, and the Pope of Rome requesting reparations for Afrodescendants. To keep up with the latest developments in the fight for Afrodescendant human rights and reparations, and Mr. Muhammad’s ongoing work, join the Lost-Found Nation of Islam/Afrodescendant Nation news list here.